Confessions of a 20-something Scrapbooking Mother: Four wheelin'! Well, now that the boys and I are in a routine, I've set a goal of completing 5 layouts a week. So far, I've done 5 in 3 days, so I'm pretty happy with myself! 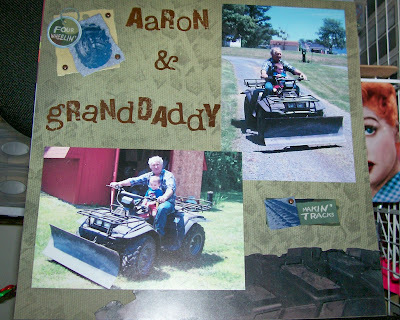 Here is one I completed last night of Aaron and my granddaddy taking a ride on the 4 wheeler! The paper and the stickers are all Karen Foster. I wish you could see it better, but there is a large tire sticker at the bottom which is super cute. The rub ons are from TLC. I also added a few brads to the stickers. I finished 2 other pages today, but I will wait until tomorrow to show them! Aaron and my hubby have overtaken our television to watch the Giants game, so I am taking advantage of this to go to bed early, curl up in my pjs and watch a movie! Hope you all had a wonderful day, and thanks so much for stopping by!! I can see the large tire sticker, and it's awesome! 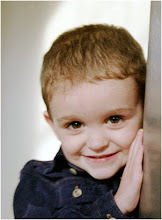 Great layout and such cute pics! I have to admit though, those 4 wheelers and ATVs make me so nervous! I'm sure Aaron loves take a ride with grandpa!